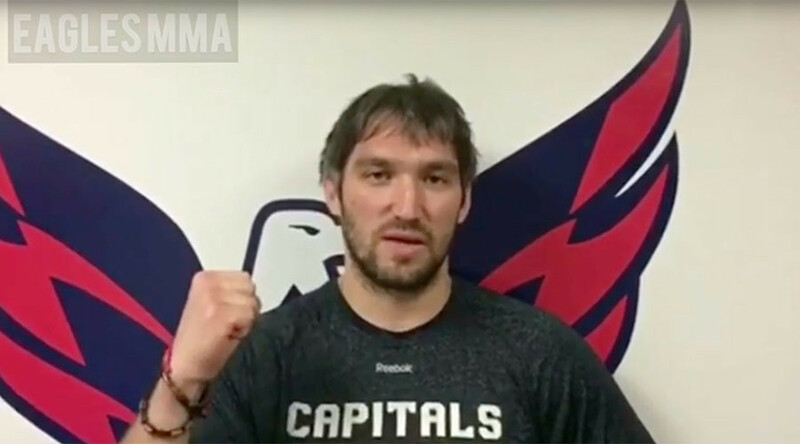 Russian Ice Hockey superstar and Washington Capitals captain Alexander Ovechkin expressed his support to a fellow Russian Khabib Nurmagomedov in a video posted on Friday. “Hi Everybody! I am Alexander Ovechkin of the Washington Capitals. I would like to wish Khabib luck in winning the belt. We will all be rooting for you, bro!” Ovechkin said in Russian on the 7 second video. The message of support comes just a day before Nurmagomedov’s fight for the UFC interim lightweight championship against American Tony Ferguson, the fight Khabib described to RT Sport as the biggest fight of his career. Nurmagomedov will face Ferguson in the co-main event fight at UFC 209 in Las Vegas, Nevada, which will be headlined by the welterweight championship bout rematch between champion Tyron Woodley and Stephen Thompson. Khabib was also crowned ‘International Fighter of the Year’ at the World MMA Awards last night, beating fellow fighters Michael Bisping, Joanna Jedrzejczyk, Conor McGregor and Gegard Mousasi for the award.